Edit Pattern is used to create a new pattern or edit an existing pattern. Set Tempo is used to set the tempo for the current pattern song and project, in beats per minute. Edit Pattern Info is used to change a pattern's name, and change the number of beats the pattern has. 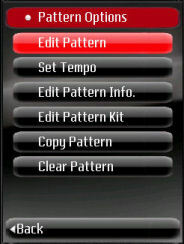 Edit Pattern Kit is used to edit a selected pattern's drum kit instruments. Copy Pattern is used to copy a pattern. Clear Pattern is used to clear the contents of a pattern. Any changes to patterns may be reflected in the song. For example if a pattern is cleared, then it is no longer present in the song.